Villa Praia benefits from a fantastic position virtually on the doorstep of the beautiful Lourenco Beach! So imagine lazing by your private pool with a cool drink admiring the sea views. What's more Gale Beach and a small choice of restaurants are within a few minutes on foot. 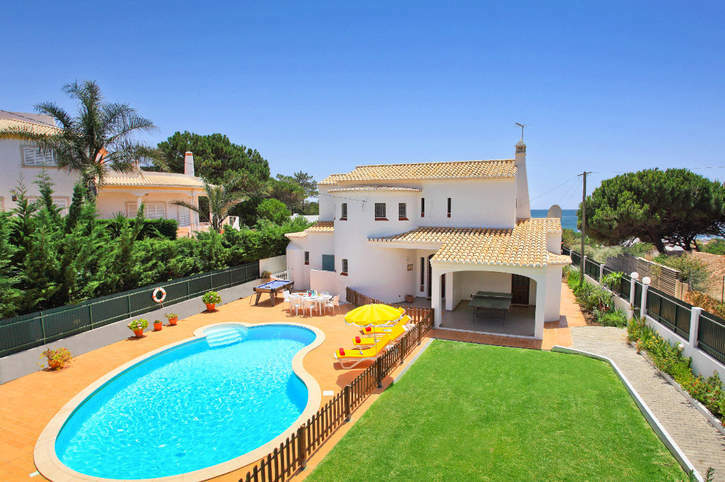 Nearby, Guia and Albufeira with a host of amenities are within 10 minutes' drive from this attractive 3 bedroom villa. Air conditioning/heating in the bedrooms, WiFi and a gated pool are included. The fabulous location - not 1 but 2 beaches within walking distance. Great choice! There is a large private swimming pool and lawned garden with ample space to relax and soak up the sun. The pool is gated and has Roman steps for extra peace of mind. There's a covered terrace for welcome shade, as well as a brick BBQ and table and chairs for dining alfresco in true Portuguese style. The main entrance is to one side of the house and opens into a hallway with the living area in front of you through an archway. The lounge has ample seating and dining table and chairs, along with 2 sets of patio doors. One leads to a generous terrace at the side of the villa. The other to a terrace with views over the rear garden and towards the sea. Adjacent to the lounge is the fully equipped kitchen with a breakfast table for enjoying your morning coffee. On the ground floor there is 1 double bedroom and a separate shower room. A circular staircase from the hall leads up to the remaining bedrooms on the first floor. These consist of 2 twin bedrooms, one with an en suite bathroom, the other with an en suite shower room. Both have patio doors opening onto a shared, spacious terrace with panoramic views over the sea. This villa has applied for a licence and the submission number is AlojLocal/2009/201. The licence number will follow. Villa Praia enjoys a fantastic location on Portugal's South Coast, only a minutes' walk from Lourenco Beach, and further on to Gale. There is a wooden boardwalk onto the sand with a beach bar at the top overlooking the sea, as well as couple of restaurants within easy walking distance. In Guia and Albufeira - a short drive away - there are a wider choice of restaurants, attractions and beaches. Our Villa Gregorio is on the opposite side of the street. There is a mini market within walking distance from the villa, whilst nearby Albufeira, a drive to the east, has all manner of shopping amenities to keep you busy. A little further on is Praia D'Oura with plenty of shops to browse. There is also a large mall within driving distance called Algarve Shopping - for shopping on a larger scale. Aside from the restaurants within walking distance in Guia and Albufeira there a wider choice on offer, around 10 minutes' drive away. Guia itself is the renowned home of the typical Algarve dish, spicy chicken piri piri - well worth sampling! Further on from Albufeira, is lively Praia D'Oura with its thriving nightlife scene, many clubs playing music late into the night. The nearest beach, Lourenco is just a few steps away, which has a beach bar serving both food and drinks. What better place to relax with a cool drink overlooking the sea? Gale Beach is 10 minutes' walk away, whilst several other excellent beaches are also within a short drive. These include the picturesque coves of Coelho and Castelo, each with a snack bar/restaurant. Or, Aramacao de Pera also has impressive large beach for a great day out. For those with children there is a choice of water-slide parks and the Zoomarine aquarium and dolphin show are both within 20 minutes' drive. You will be spoilt for choice for a family day out in the Algarve. Albufeira Old Town has a lot of Moorish history and is certainly worth a visit. It's just a short drive away. Take refuge in its churches which date back to the 1500's or explore the warren of cobbled streets that provide a welcome shade from the heat. For those wishing to explore further, Villa Praia's location means that almost anywhere across the Algarve can be reached in an hour or so by car. For golfers, the nearest course is Salgados, just 1½ miles away, or alternatively the 9-hole Sheraton Pine Cliffs course to the other side of Albufeira, near Olhos d'Agua. Villa Praia is not available to book for season as it is sold out. Take a look here at the Algarve villas that are currently on sale. Excellent villa in a great location. Highly recommended. This is one of the best companies I've ever had the pleasure of holidaying with. This villa was outstanding. The setting was beautiful. The villa was clean and well equipped. Angela our villa rep was one of the nicest ladies I've ever met. Nothing was to much trouble for her. Anyone going to this villa will not be disappointed. Well done Villa Plus for a excellent holiday! The pictures on the website did not do this Villa justice - It exceeded expectations and the view.....WOW!! This villa is lovely. It's proximity to the beach is undeniably its best asset. You will definitely need a car if you stay here because the nearest restaurant is around 20 minutes walk away. We would most definitely stay here again. Angela the representative was such a helpful person and she is a real asset. All in all a lovely time was had by all. Thanks Villa Plus. Fantastic villa, excellent service and customer care, which led to a brilliant holiday. We will definitly book with Villa Plus again and will also recommend Villa Plus to friends and family! Thanks for a great holiday! We were extremely impressed with everything - ease of booking, flight arrangements, car hire, directions and the very accurate description of the villa we rented. It was brilliant and we will book with Villaplus again. Many many thanks. We had a great time, the villa is in a wonderful location and I would certainly consider renting it again. My three year old grandson had a wonderful time in the pool and developed a taste for the delicious clams served at the beach restaurant. Holiday was excellent and I would recommend Villa Plus to our friends. Our first holiday with our children (3 & 8) and our first villa holiday. Fantastic! Couldn't fault a thing. Kids loved the pool and we loved the peace of mind. Arrangements and information provided were good, flights good, car hire good (even upgraded us FOC), villa and weather were even better than we'd hoped for. We only had one problem - we lost a teddy bear when we first arrived, we left it at the car hire reception. One frantic call to the rep at the airport and he was returned the next day after spending the night at her house. One 3 year old very happy. Above and beyond the call of duty and very much appreciated. We had a great holiday - thank you. We haven't stopped talking about it and recommending your company to all our friends and family.